FIFA 16’s Ultimate Team is, without a doubt, it’s highlight feature and offers up a really fun time within a game that only sees minor gameplay changes each year. The opening of packs, the buying of coins, the selling of players, the creating of teams and much more are what make FIFA 16 arguably the most popular single mode in any game in our modern generation. YouTube stars and Twitch stars have really utilised the popular gameplay mode as many people love to see countless packs opened hoping for in-form players and more. However, what players are you looking for? Which are the top 10 highest rated players in FIFA 16 which will allow you to have the best team possible? As with FIFA 16 Ultimate Team rules, we will state the Player, their team, their nationality and which League they’re from as these are the key components when trying to create the best team with the best chemistry. David Silva was an incredible player for Manchester City in the Premier League last season registering a huge number of assists and key passes that make him one of the best passers and one of the best dribblers on the game. 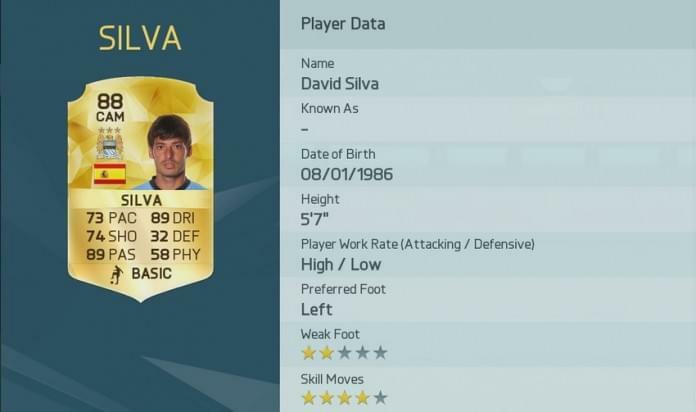 He may be small and weak but the ability to ping key passes in FIFA 16 is more important than in any previous FIFA game.